Many people use a home safe to store important and valuable items. Honeywell safes are a popular choice, particularly the Honeywell model 5101. However, these digital safes are battery operated, and if the batteries die, it can be difficult to access your belongings. Nonetheless, there are some ways to get into your safe if the batteries are dead. Typically, a digital safe will have lights and make beeping noises. If these are both absent, that's usually a good sign the batteries are dead and you haven't just input the wrong code. 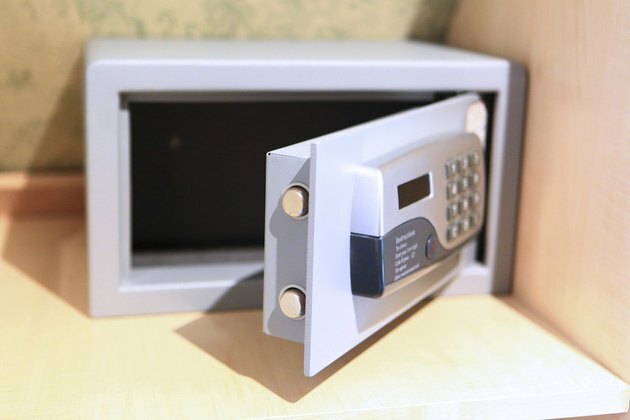 Honeywell recommends changing your safe's batteries at least once a year, even if there aren't yet signs of them dying, and more often if your safe is used regularly. The best way to access a Honeywell combination safe if the batteries have died is to use your Honeywell safe key. To do this, refer to your Honeywell safe instructions to find out where the emergency keyhole is located on your safe. Most often, this will be underneath the safe's batteries. To access it, you must take the cover off of the safe's batteries and remove the batteries. Insert your Honeywell safe key into the emergency keyhole and turn clockwise. At the same time, try to open the safe's door. This should give you temporary access to your belongings. If you can't find your emergency key, Honeywell provides a service through which you can get a replacement. To do so, you'll need to provide information regarding your safe including proof of purchase, order information and the specifics of your safe, including serial number. The service costs $12 and is available via phone, email or post. After accessing your belongings, if the batteries of your Honeywell safe are dead, you'll want to replace them. You can refer to your Honeywell safe digital manual (available online) in order to find out what battery type and size your safe requires. After you've removed the old batteries and inserted new ones, you'll need to reset the safe's combination. To do this, press the reset button located inside the safe, and a yellow light or a beep will indicate you can reset. Type in your new passcode within 30 seconds. Then, either the light will go off or you'll hear a second beep, which confirms your reset has been successful.